William Fiers est actuellement chercheur en sémiotique liée à SEMANET, groupe d’étude sémiotique aux Pays-Bas. Il a étudié à l’Université de Rotterdam (PB) et au « Center for semiotic research » de l’Université d’Aarhus (DK). Il détient un doctorat en sémiotique obtenu à l’Université de Limoges en 2002 (intitulé de la thèse : Polysensorialité et systèmes sensori-moteurs dans l’Enfer de Gérard Garouste). Il a publié des articles (NAS, Protée, Visio entre autres) portant notamment sur l’esthétique et la sémiotique visuelle dans lesquels il montre un intérêt pour la polysensorialité, la sensori-motricité et les phénomènes de la perception. On rappelle notamment “Polysensorialité et systèmes sensori-moteurs. A propos de quelques Sans Titre de Gérard Garouste”, Nouveaux Actes Sémiotiques, n°86-87, Limoges, PULIM, 2003. La peinture est l’œuvre d’une instance de l’énonciation, le peintre, qui inscrit son geste sur une surface d’inscription, la toile. Elle est le résultat d’une mise en forme, d’un faire artistique, relevant d’une compétence technique gestuelle, mais également d’un savoir- comment-faire, relevant d’une compétence cognitive. Quand la mise en peinture technique d’un simple cercle est le résultat d’un faire maîtrisé  une figure décrite par toute ligne dont une extrémité est fixe, et l’autre, mobile (définition générique)  son savoir-comment-faire suppose une connaissance – le cercle comme lieu des points situés à égale distance d’un point nommé centre (définition spécifique) – qui guide et structure le geste technique. Si l’on applique ces considérations à la construction de la perspective, on sera amené à considérer celle-ci comme la mise en application d’une compétence cognitive spécifique. A travers un tableau d’Auguste Aridas (1848-1929, peintre et professeur de dessin à Limoges pendant de longues années), représentant un véritable cours sur la mise en perspective, tant au niveau énonciatif qu’au niveau énoncif, nous essaierons de mettre au clair le fonctionnement sémiotique de la perspective comme « dispositif d’énonciation paradigmatique » (Damisch). A painting is the work of an enunciator, the painter, engraving his gesture, his manual sensory-motor movements, on an inscription surface, the canvas. What we call a painting is thus, on a basic non-aesthetic level, not only the result of an artistic «doing» related to a technical competence, but also of a «know-how-to-do-it» related to a cognitive competence. The drawing of a simple circle is both the result of a controlled doing of the painter’s hand and of a presupposed know-how guiding and structuring his manual gesture. These considerations can be applied to the construction of pictorial perspective. In that case, we need to elucidate the cognitive competence underlying its technical procedures. In this paper, we discuss perspective in a painting of Auguste Aridas (1848-1929), painter and professor at the National School of Art of Limoges for many years. We will try to expose the semiotic functioning of perspective on the enunciative as well as on the «enuncive» level as a «paradigmatic device of enunciation» (Damisch) by focussing on its pragmatic implications. We offered a first example of « gestual semiotics » in Fiers (2002, 2003). The history of visual semiotics can be understood as a continuing search for autonomy with respect to the general domain of verbal semiotics. From the figurative approach of visual languages worked out by A.J. Greimas in the 1980’s, followed by the plastic approach of J.M.Floch, until the Semiotics of the Visual World of J. Fontanille, visual semiotics has gradually liberated itself from the « linguistic guardianship » and has recently rediscovered the authentic pragmatic dimension of pictorial act underlying the creation of pictorial form. The sense of visual enunciation is obtained, respectively, by mapping a linguistic grid on the visual signs (Greimas), by means of the semi-symbolic correspondence between categories of visual iconic signs and categories of language (Floch), by means of the basic elements of light perception – brilliance, illumination, colour, light materialisation – (Fontanille) and finally by means of a sensory-motor typology bringing artistic creation back to its origin : the physical act of artistic gesture1. Instead of accepting an a priori existence of « plastic figurative elements » or « light effects », it’s first of all important to understand how these figurative elements appear on the surface of an artistic work and how light effects are made visible by means of human creative intervention. The square, the circle and the plastic geometric orientation of a painting are above all the result of controlled gesture – the skilled hand holding the brush and putting delicately paint on the canvas  ; the level of brightness we detect is a result of the painter applying clear colours. In other words, the way a painting is morphologically made visible dominates the emergence of its visual meaning. Consequently, we have to take into account that the pictorial morphology emerging through the painter’s creativity is a part of the geometric domain and its laws. The technical skills of painting are doubled by a « know-how to do it », a cognitive competence concerning the way a form should be correctly painted. It’s this « meta »-knowledge that guides the artist’s hand and, vice versa, it’s the hand that activates the potentialities of this « meta »-knowledge. Perspective in a painting results thus both from a controlled application of artistic skills and from the possession of complex geometric knowledge. In this paper we propose to analyse their cooperation with help of a painting of Auguste Aridas, a painter and professor of the Art School of Limoges (France) at the end of the 19th century, in order to elucidate the semiotic functioning of perspective in a specific pictorial universe. Panofsky mentions antique Greco-roman « fishbone » perspective ; « aggregate » perspective characteristic of medieval art representing space by means of a juxtaposition of separated plastic localities occupied by different figures, and finally « mathematical » perspective characteristic of the systematic world vision of the Italian Renaissance. In semiotic terms, Panofsky’s approach is only concerned with the way we envision depth in the flat surface, the way the material pictorial expression « vanishes » and the physical activity of the artist disappears an imaginary observation of the painting as a 3D space. Daniel Arasse, Histoires des peintures, Paris, Gallimard, 2004, p. 47. According to Daniel Arasse, perspective is the invention of a specific way of proceedings that has succeeded in becoming the dominant form of representation in painting. Arasse considers centred mono-focal perspective based on elementary geometric laws as the main reference of the functioning of pictorial perspective. Geometric centred perspective becomes the dominant model of pictorial representation from the 15th century until 19th century impressionism. As Arasse puts it : « With Whitesquare on white surface, it’s all over, there’s no perspective anymore »3, in other words, for Arasse from that moment on the centred perspective is no longer the dominant model used in painting. The classical model consists in « a fundamental intellectual operation » implying a geometric-mathematic know-how. Perspective is « a tool of construction » of which the painter disposes with a relative freedom in order to construct an image of the world. Since the system is only composed of three basic coherent parameters (size of the framework, vanishing point, distance point), the artist is free to vary the parameters in producing different configurations. In short, Arasse considers centred perspective as an organisation scheme whose parameters are for centuries of a remarkable stability and longevity.4 But finally this classical scheme is being replaced by another organisation scheme, which Arasse no longer qualifies as centred-perspective related. According to Hubert Damisch « perspective provides the painter with a regulation device allowing him to orientate and control the mode of representation ». Pictorial perspective can be compared to an enunciation procedure utilizing an indivisible point identical to the one used in natural language we call « subject ». This subject is « an effect of structure », always related to a « here » or a « there » and to every possible movement between these two positions.5 Perspective, says Damisch, could be considered as a paradigm or « a declination or conjugation model offering a practical device : a formal toolset composed of a viewpoint, focus and distance point ». As such, Damisch concentrates on the way perspective deploys itself as an extensive spatial-temporal grandeur in a pictorial space offering a structure where one encounters and seizes the morphological elements essential to understanding. Jacques Fontanille, les espaces subjectifs, op.cit., pp.80-81. In making a difference between a figurative variable pictorial space, « a discontinuous space where the pictorial actors are located », and an underlying invariable figural space, « a continuous space composed of shapes and colours », Fontanille proposes a double interpretation of perspective.7Two cognitive dimensions control these two types of semiotic space : « an abstract cognitive dimension affecting the spatial relationships themselves, and a figurative cognitive dimension affecting the positions and proportions of the figures in the pictorial space ». The connexion of the two spaces established by the cognitive operators reduces the technical functioning of perspective to a verbal semiotic procedure of narrative inter-subjectal conflict translated into a multitude of types. This conflict concerns an « epistemology of perception », an unembodied, rule-imposing perception occupying a neutral objective place in the field of analysis. In this paper, however, we propose to place the feeling body in the centre of our analysis and to take into account the effect of corporal presence on the semiotic procedures. This means that we have to revise the classic semiotic function and no longer consider it as a function based on a iso-morphological relation, but as function based on the implicated body and its sensory-motor structures. It follows that the functioning of perspective cannot be reduced to a juxtaposition of two cognitive operators disputing the dominance of a preconceived pictorial space. We propose to question perspective in painting from a pragmatic point of view : the way in which the artist has subjected the composition of pictorial space to a particular organisation. This point of view implies that we have to reintegrate into the field of visual semiotics a domain excluded from it from the beginning, that is, the different modes of geometric construction the painter uses to execute perspective. These modes concern his know-how; in particular his technical and his cognitive skills, his « know-how-to-do-it ». As a result, inter-subjecticity as Fontanille sees it is no longer a matter of a confrontation of two cognitive operators, but a consequence of the way the enunciator (the painter) deploys his sensory-motor skills (the way he handles his brushes and moves his hand on the canvas) and conducts their operations by his cognitive abilities. The enunciator produces a space in which he locates his artistic activity according to his own corporal presence : he delimits his pictorial presence on the canvas (the shapes and colours he produces on the canvas) in reference to his bodily presence as a painting and feeling artist. What we call « the self » is that part of the enunciator, which programs its sensory-motor structures in a series of geometric pictorial events by means of bodily conducted gestures. These gestures are related to the geometric domain and its laws during the time the pictorial form takes shape. In this relatively short lapse of time, they measure themselves to an a priori taxonomical basis of eidetic invariants. Thus, the painter is able to produce « morphological inexact but geometrical ‘pure’ shapes : ‘round’, for example, is a qualification of a shape referring to the geometric ideal ‘circle’ ».8One can in fact replace a specific definition of a figure – the circle as a figure of points situated at an equal distance compared to a point called centre – by a generic definition : the circle is a figure traced by every line which has one point inert and the other point mobile, moving ‘round-wards’. Now, if one applies this reasoning to the construction of perspective in painting, it follows that we have to consider perspective from the point of view of its technical creation. Instead of studying the way perspective is perceived, we should first of all study the way it is geometrically conceived and created by the artist. In other words, we should try to understand what caused it, before analysing the consequences. The praxis of perspective obliges the painter to use and manipulate appropriately specific fundamental geometric parameters, furthermore, to have a talent to put them into practice in a logical way, that is, to realize a pictorial program in deploying a given number of plastic procedures. The enunciating activity of painting requires the possession of a meta-semiotic knowledge articulating itself in semiotic procedures of enunciative disengagements that affect spatial and geometrical relationships by means of abstract cognitive modelling. The possession of this meta-semiotic knowledge (a cognitive competence) permits the painter to geometrically optimise the praxis of perspective (the performance), to control his gesture, to subject his technical sensory-motor skills to a continuous verification all along the creative process. The perspective praxis in painting implies the use of a transformation rule realized by the application of a series of techniques. These techniques allow to draw a number of coherent structures on a 2D surface in order to suggest a 3D space. Consequently, we consider this transformation rule as a result of a progressive embodied inscription of an enunciative activity, the artist, on a material inscription surface, the canvas, which receives a specific composition, the painting. The artistic activity – the colouring, shaping and putting in perspective of the canvas – precedes, underlies and determines the semiotic interpretation of the work ; the formation of the pictorial shapes, the morpho-genesis, generates an extensive grandeur composed of plastic positional actants (geometrical shapes), orientations, kinetic-dynamic horizontal and vertical tensions, emergence - and vanishing-points determining the way the enunciatee encounters and seizes (saisie) the pertinent structures for an adequate understanding of the pictorial universe. Therefore, it’s no longer useful to consider the enunciatee as a mere subject, reduced to a positional agent with a generic exterior « point of view », but as a feeling subject who actualises and realises himself in and with the creative process of the painting. The enunciatee is an intensive grandeur replacing the notion of observer, mentioned above, by a feeling body that interrogates pictorial space and activates the semio-genesis from inside the pictorial universe. If we want to understand the significance of a pictorial utterance, we have to take into account two basic orientating grandeurs : the extensive grandeur of a painting is represented by its basic chromatic-morphologic structure, on which the enunciatee, the intensive grandeur, orientates his sensory-motor system and distributes his sensation and imagination (visée). Many thanks to Alain Dionnet, Head librarian of the Municipal Museum of the Bishops Palace of Limoges for allowing me to consult the documents available on Aridas’ life and work. The subject of the painting we’re going to examine, as its title indicates, is a morning class at the School of Decorative Art. 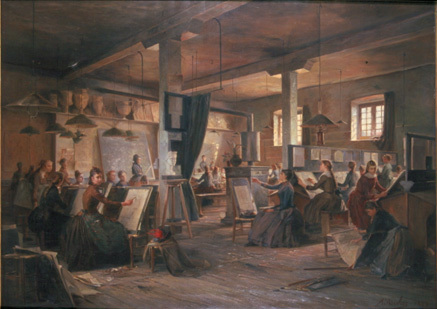 In the academies and schools throughout the 19th century, the students learned the application of the technical rules of pictorial expression. At the same time, a particular place was reserved for the teaching of history and literature. The teaching the academies imposed was very homogenous giving little space to individual creativity. In the second halve of century, a growing discontent towards the rigid form of teaching and a refusal of the academic precepts could be observed. One of the main results of this critical attitude was the search of new subjects situated « in open air » : light and colours, as the impressionist movement promoted.10This painting of Aridas of 1889 is a timid example of end 19th century’s will to challenge the stylistic directives of academic teaching. The windows of the classroom let in a bright daylight and allow a sunny morning to break the severe forms and architecture of a dim and musty space. The subject of the painting is about the teaching of classical drawing and its technical rules based on the theorems and concepts of geometry. Aridas, as a fine professor of drawing, wants us to know that geometry is still the basic domain of drawing – i.e. geometrical theorems potentially present basic possibilities of drawing – and that only through physical repetitive manual exercise one can learn its applications and assimilate its inner logic. The students learn how to use pre-existing notions and propositions within a pre-defined methodological setting and this « know-how to use », this « know-how to do it » represents the main topic of the painting. The exercise, the assimilation of a technique by repetitive gesture, with help of instruments (rulers, cords), but most of all efficient observation and understanding are essential skills academic teaching imposes in order to teach the students to conveniently execute a drawing or painting. Therefore, Aridas’ painting does not only give us the opportunity to have a closer look at a 19th century drawing class, but most of all demonstrates the methods the professors are teaching through the way the artist himself applied them to his proper painting. The overlapping of two levels of signification, i.e. the enunciative level (the extremely dense geometrical structure the painter has used), and the signification level inside the painting itself (the narrative unfolding of the class), invites us to discover the way the painter-professor Aridas painted the classroom scene and allows us to virtually repeat the pictorial gestures he deployed and thus to understand the signification of the painting’s sensory-motor structure. The interesting thing in this painting of Aridas is the way in which the perspective procedures are explained on the enunciative level. These procedures underlie the narrative unfolding of the drawing class as a pictorial discourse. In fact, two levels of identification are proposed to the public interrogating the painting : - an enunciative identification between the observer-interrogator and the enunciative markers of the painting (the way the artist technically conceived the painting) ; - an « enuncive » identification between the observer-interrogator and the narrative actors (the students and professors situated inside the classroom). In the painting of Aridas, these two levels don’t match exactly with the plastic-figurative level. There is a divergence between the figurative unfolding of the enunciation and the unfolding of the narration. This divergence forces the interrogator to take a stance between two different levels : the enunciative level, the way the painter created figurative syntax in using pictorial shapes and perspective, and the « enuncive » level, the way a narrative syntax emerges from the spatial-temporal setting of pictorial actors and objects. The co-emergence and co-existence of two types of pictorial manifestations in one coherent universe presupposes an articulation of the figurative space concerning the semio-generic unfolding and the « figurive » space concerning the morpho-generic unfolding. To understand this co-emergence, we need to determine the locations and functioning of intra-pictorial semio-figurative connexions. It seems to us that these connexions play an important role in the construction of a 3D perception on a 2D surface. In the second and last part of this paper, we will try to clarify the way in which the painter has shaped perspective, i.e. how a 3D perception of the pictorial universe is morphologically made possible. For practical reasons, we have chosen to discuss only the classical geometrical form of perspective Aridas used in his painting. Other alternative forms as morphological overlapping, volumetric or atmospheric perspectives, also present in this painting, are left aside. Perspective is the result of a technical operation on the flat pictorial surface we are going to analyse as the unfolding of morphological extensive grandeurs that are organized according to a geometrical rule of transformation. This rule is implemented by four basic parameters allowing the intensive grandeur (the observer-interrogator of the painting) to physically become a part of the pictorial universe (the embodiment of perception). The further the intensive grandeur advances into the pictorial universe, the more he is stimulated not only to interrogate what he perceives but also to undergo the same transformations as the morphological pictorial universe he seizes. As a consequence, he feels as if he physically enters a 3D world. We propose to analyse the functioning of perspective according to its four basic parameters: the frame measures, the horizon line, the vanishing point and the distance point. a) The framework of the painting is the first parameter of the transformation rule. The way we seize and apprehend the pictorial universe is never neutral, but always accompanied by basic sensorial impressions. The feeling body is the source of this act of seizure (saisie). It’s he who feels the physical effect of perception ; it’s he who captures the forces and tensions. This primary and essential physical perturbation constitutes the thymic unspecified foundation on which the process of signification takes root. It prepares the corporal introduction of a generic interpreter into the pictorial universe as an intensive « implicated » grandeur whose energy (imagination, feelings) subsequently is received and canalised by the shapes and colours of the painting. The framework determines the space where the painting takes form: it creates the surface of inscription where the painter unfolds its gesture. But most of all, the framework gives the painting an autonomy and a dimension imposing a basic constraint both to the scale of perspective deformation and to the embodied inscription of the intensive grandeur in the pictorial universe. Furthermore, the framework’s dimension is used as a basic reference in relation to which the dimensions of the shapes inside the painting are evaluated. The dimensions of the painting of Aridas are 190 cm × 125 cm, i.e. a medium-size painting. However, the geometrical structure is relatively complex. In order not to disturb the process of seizure, Aridas places the principal action in a diamond-shaped structure formed by several vanishing lines and situated in the centre of the painting. Simultaneously, only some vanishing lines (the planks of the ceiling and on the floor) occupy the inferior and superior parts of the painting. In addition, Aridas has painted the zones close to the left and right side as well as the corners of the painting in darker colours. In this way, he chromatically frames the classroom: the painting contains a second framework inside its principal framework reducing the dimensions of the visual field and facilitating the embodied inscription of the observer-interpreter in the pictorial universe. b) The horizon line is the second parameter of the transformation rule. In tracing it, the enunciator installs a principal partition inside the painting; an initial act of enunciative disengagement on the material inscription surface (the canvas) operated by a controlled manual movement. By means of this first hand motion - this first figurative abstract effort underlying the painting’s future morphological development - the canvas is transformed into a « formal » surface where the composition unfolds itself. The geometrical horizon line determines the general subdivision between the upper part and lower part of the painting. The horizon is a first tension line situating and orientating the extensive grandeurs, the pictorial morphologies on which the procedure of cognitive seizure adjusts itself, and the intensive grandeurs, our imagination and sensation, the filters through which we «invest» the painting with qualitative values. If the horizon line is situated near the lower part of the painting, the upper part dominates the lower part : the shapes of the pictorial universe are seized from a low angle vision. As a result, the vanishing point, situated on the horizon, is close to the base line (the lower horizontal edge of the frame), causing a feeling of growing proximity towards the pictorial universe. The observer-interrogator has the impression that the pictorial forms impose themselves through a forward-directed movement threatening to oppress over even overwhelm him. If the horizon line is situated near the upper part of the painting, the lower part dominates the upper part and the shapes of the pictorial universe are seized from a high angle vision. The vanishing point on the horizon is relatively far from the painting’s base line. As a result, we have the feeling that the painting « opens up » in our presence and that its shapes are moving backwards, giving room to sentiments of control and power. If the horizon line is situated near the centre, the painting is divided in two equal parts and the shapes of the pictorial universe are seized parallel to the standing position of the observer-interrogator. The vanishing point is equidistant to the painting’s base line and its top edge. As a result, we have the feeling that we enter a well-balanced, stable universe. Although the horizon line is the place where the enunciator has initially imagined to centre our vision, we turn this line instantaneously into the principal horizontal grip for our feeling body in general in order to stabilize and regulate our emotional-sensorial energy. Once located, the horizon line offers a first control to the intensive grandeur, inaugurating an initial orientation to his impressions (high angle vision, low angle vision, parallel vision). Therefore, our cognitive seizure of any given pictorial universe is immediately somatically marked with spatial-temporal notions (before/after; first/last) and physiological notions of abduction and adduction (backward/forward motions ; push and pull). The horizon line in this painting of Auguste Aridas is situated slightly beneath the geometric line cutting the canvas in two equal horizontal parts. If we observe closely its progression, we see that it passes through the eyes of four students on the left side of the painting (the girl sitting on the stool looking at the observer-interrogator and the three girls situated on the second level of the painting, studying a bust from behind), the inferior part of the bust, the edge of the stove’s drawer in the centre and the superior edges of the drawing maps of the students on the right side. It appears that the observer-interrogator is stimulated to seize the shapes in a parallel way, in the direction of the drawing maps, as if he found himself on the same level as the students in the painting. Thus, he makes integrally part of the space of the classroom as a genuine narrative participant. The inclusion of the observer-interrogator - « in standing position » - into the pictorial scene facilitates his perception of the shapes and colours. Their cognitive seizure is therefore somatically less subjected to perturbation as would be the seizure of a high or low angle vision painting where the observer-interrogator is firs of all obligated to readjust his sensory-motor systems and to resituate his feeling body with regard to the physiological impressions of adduction or abduction. c) The vanishing point is the third parameter of the transformation rule. It indicates the perpendicular projection of a geometrical point situated on the horizon line where a given number of oblique lines we call « vanishing lines » converge. The vanishing point reinforces the inscription of the observer-interrogator into the pictorial universe. We no longer consider this inscription as a position of a generic « point of view », but as an authentic engagement of the feeling body in a work of art. Using his sensory-motor systems, the observer-interrogator is able to find his way inside the painting while negotiating constantly the different forces, tensions and psycho-sensorial barriers he runs into in order to transform the flux of sensorial experiences into a world of signification. The vanishing point is considered as the keystone of the perspective construction. But with regard to its place and consequently to its spatial-temporal unfolding in the pictorial space it is dependent on the horizon line on which it is situated. However, once it is established on the horizon line it subjects the way we consider the 2D shapes in pictorial space to a 3D transformation. In other words, what we call « vanishing point » is not a real point but a « transformational direction » or, as Damisch puts it, a « passage signalling itself with help of a point ». The vanishing point is indeed nothing more than a controlling device the enunciator situated on the flat surface, in order to open a network of « auto-morphic » lines (i.e. lines that are structurally stable through the transformation they undergo) and to stimulate a 3D vision. The moment the observer-interrogator identifies the vanishing lines he somatically feels the transformation effects of the geometrical operations as a 3D change of his own visual field. As a result, his emotional and imaginative energy crystallises into actual impressions of imaginary depth. In this sensorial-cognitive process lies the real sense of what Jean-Marie Floch calls an « iconic contract » : the persuasive doing of the enunciator generates a receptive structure we call an extensive grandeur, on which the intensive grandeur (observer-interrogator) deploys his embodied sensorial-cognitive activities of seizure (saisie). This iconic process of perspective transformation – the realisation of the geometric transformation rule as an iconic program through the progressive unfolding of its parameters of control – is obtained by the canalisation, structuring and geometrising of sensorial and imaginative energy. Aridas’ painting shows us that the vanishing point as such is no more than a control device used to situate the vanishing lines in the painting. In retracing the underlying geometrical structure, we discover that the painter exploited two lateral vanishing points placed outside the actual framework, situated on the extension of the horizon line. Two networks of vanishing lines are thus horizontally projected on the painting, forming two « boxes » in the same space. The networks don’t intersect at the geometric centre of the painting where Aridas has painted, symbolically, a small geometric cube, but he situated their assemblage zone close to the big cylinder of the stove. The network projected from the right side is responsible for the construction of the left side of the painting and, vice versa, the network projected from the left side is responsible for the construction of the right side of the painting. But since the assemblage zone is situated slightly to the right of the geometric centre, the painting is principally orientated to the right. This impression is reinforced by the accentuation of the vanishing lines opening up the pictorial space to the right. As the vanishing lines are horizontally orientated, the impression of depth is in a certain way stretched out and therefore less prominent. But in using also certain forms of « atmospheric perspective » (loss of detail, blurry contours, impressionistic strokes) and in situating objects painted in « cylindrical perspective » in the centre of the painting, Aridas successfully counterbalances the dominant horizontal effect of the painting. In this way, the bilateral geometric perspective and the loss of depth it causes in the relatively limited space of the painting is neutralised by supplementary depth suggesting impressions. Hubert Damisch, L’origine de la perspective, op.cit., p.129. d) The distance point is the fourth and last parameter of the transformation rule. It is a geometric point technically situated « outside the painting, but pragmatically included into its universe and located on the horizon line. Used as a reference point, its role is to determine the scale of relative diminution of the transverse quantities and the rapidity of foreshortening with regard to the progressive unfolding of the perspective dimension »11, i.e. the division in equal parts of depth obtained by the intersection of the vanishing lines and the oblique lines projected by the distance point. The distance point represents the lateral projection on the horizon line of the supposed frontal distance of the observer-interrogator in relation to the painting’s vanishing point. The distance point determines the « angle of seizure » of which the horizon line situates the top and the vanishing point the orientation. The functioning of the transformation rule of perspective and, as a result, the general aesthetics of the painting, depends on the location of the horizon line, vanishing and distance point. The artist is free to vary the parameters, but has to respect nonetheless certain limits in order to avoid visual deformations. In raising or lowering the horizon line and consequently the vanishing point, the degree of the seizure angle becomes bigger or smaller reinforcing or diminishing the effects of high angle vision or low angle vision and, in case of frontal seizure, the effects of vertical proximity or distance. Perspective is thus a result of a complex dynamic process of adjustment, adaptation and focalisation of geometric parameters in order to transform pictorial materials into a 3D figurative composition. It’s a « construction whose relative arbitrary or necessary features are measured in relation to the fact that the parameters can be changed and transformed within certain limits without being detrimental to its economy and its basic invariants »12. In projecting the distance point laterally on the horizon, we discover that it is situated at the same place as the two exterior located lateral vanishing points, in other words, at an equal distance in relation to the frontal position where the painting is pinpointing the observer-interrogator. The angle of seizure is equivalent to the angle of the vanishing lines projected on the pictorial space. The two lateral vanishing points and the frontal distance point form together a triangle whose tops are interchangeable. The two vanishing points and the distance point can be inversed so that we can contemplate the painting from a typical « classic » point of view: two exterior lateral distance points and one vanishing point give the intensive grandeur the opportunity to situate and orientate the energy of his feeling body in two different ways : in taking the place of the distance point or in taking the place of the vanishing point. In short, the observer-interrogator (the intensive grandeur) can be considered as a controlling actant, as an authentic embodied parameter of the transformation rule of perspective. 1. First of all, further research would be necessary to explain the semiotic co-localisation of diverse types of perspective in one pictorial space. In this painting of Aridas, atmospheric, spherical and geometric types of perspective cohabit and draw the attention of the feeling body in one more or less coherent spatial-temporal unfolding. A possible solution to this problem would be to consider perspective in terms of a global process of iconisation of the sensorial universe of the painting (from a 2D surface to a 3D space). In the background of the painting, for instance, we see that the figurative iconic elements of the geometric perspective lose their consistency, stability and clearness. They change into vague strokes and blurry contours forming iconic abstract-figurative shapes penetrated by light effects. These forms keep however a certain sense of volume, a certain possibility to be defined in spatial-perspective terms. 2. In the second place, it would be necessary to explain the articulation of the figurative narrative space and the « figurive » plastic space where the geometric construction unfolds. 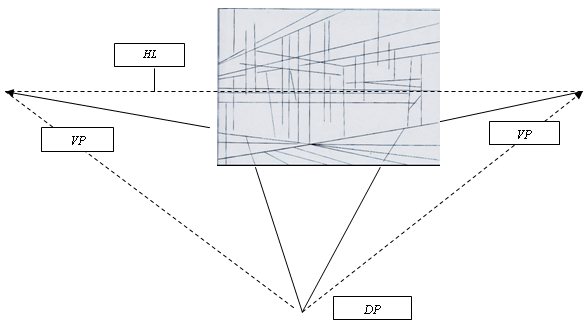 In the painting of Aridas, these two levels are not isomorphic: the narrative level (the drawing class as a rhetoric discourse on the teaching of academic art) is structured around the painting’s geometric centre; the pictorial level (the drawing class as the main subject of a plastic discourse explaining the technical pictorial skills used to paint adequately a 3D space) is constructed around the perspective centres (the vanishing points) located outside the painting. It is possible to analyse the narrative discontinuous scene with help of a « semantic seizure » of the figures present. The comprehension of what we see is achieved by establishing an analogy between certain categories of visual figurative input and certain categories of natural language. The result is a homologation procedure of the type [a ← x : : b ← y] (ex. « high » ← culture : : « low » ← nature ; ex. in Aridas’ painting : « natural light » ← impressionism : : « artificial light » ← academism). We can analyse the « figurive » continuous space with help of « tensive » semiotics and determine the figurative syntax. In this case, we deal with a primitive form of semi-symbolism [a : b…x : y] indicating the naïve, parataxical perception of random sensorial elements. The semantically uncategorized perceptive-sensorial elements (colours, shapes, orientations, tensions etc.) are transformed into stabilized values occupying a certain surface and containing a certain quality by means of a so-called « impressive seizure » (Geninasca) : the perceiver is aware of a sensorial experience first of all in the form of a simple impression, « a thymic event » in which he discovers a self-conscious existence, « by which and through which the moments of perceptive activity suffice in themselves and [are] immediately understandable, moreover, transparent ».13Next, we have to locate the plastic visual-motor connectors (determining the semiotic procedures of engagement and disengagement) of the two spaces. But as well as in the figurative space as in the figurive space, perspective is absorbed by the figurative syntax and the narrative syntax and their possible unification or superposition, whereas it seems to us on the contrary that perspective as a geometric-optic operator guarantees the superposition or juxtaposition of these two semiotic spaces. Consequently, the difference between the 3D narrative figurative space and the 2D plastic figurive surface is not a difference between two semiotic modes – discontinuous or continuous – but a gradual difference of iconicity. 3. The difficulty in understanding pictorial perspective lies in the fact that we can seize its mechanisms both in logical-semiotic terms and in aesthetic-imaginary terms. The simulation of 3D vision on a 2D surface is obtained in two complementary ways: by means of a geometric rule (we discussed in this paper) transforming the 2D plastic pictorial universe into a morphologically distorted 3D space (Damisch), and by means of an imaginary-sensorial process of progressive annihilation of the materiality of the pictorial universe leading to the creating of an « image », a 3D re-presentation of the plastic 2D presentation (Panofsky). The juxtaposition of these two underlying complementary « gradients » determines the emergence of the semiotic values of perspective inside the pictorial universe. In this way, the co-localisation of different types of perspective (geometric, atmospheric, etc.) can be explained as the semiotic avatars of the same phenomenon. Daniel Arasse, Histoires des peintures, Paris, Gallimard, 2004. Jacques Derrida, « Introduction », in Husserl, E., L’origine de la géométrie, Paris, PUF, 1962. William Fiers, Polysensorialité et systèmes sensori-motrices dans l’Enfer de Gérard Garouste, thesis, University of Limoges, 2002. Jacques Fontanille, Les espaces subjectifs. Introduction à la sémiotique de l’observateur, Paris, Hachette, 1989. Jacques Geninasca, La parole littéraire,Paris, PUF, 1997. Erwin Panofsky, La perspective comme forme symbolique, Paris, Fayard, 1975 . Stefano Zulli, Petite encyclopédie de la peinture, Paris, Editions Solar, 2004. 1 We offered a first example of « gestual semiotics » in Fiers (2002, 2003). 2 Panofsky mentions antique Greco-roman « fishbone » perspective ; « aggregate » perspective characteristic of medieval art representing space by means of a juxtaposition of separated plastic localities occupied by different figures, and finally « mathematical » perspective characteristic of the systematic world vision of the Italian Renaissance. 3 Daniel Arasse, Histoires des peintures, Paris, Gallimard, 2004, p. 47. 7 Jacques Fontanille, les espaces subjectifs, op.cit., pp.80-81. 9 Many thanks to Alain Dionnet, Head librarian of the Municipal Museum of the Bishops Palace of Limoges for allowing me to consult the documents available on Aridas’ life and work. 11 Hubert Damisch, L’origine de la perspective, op.cit., p.129.